As I sit at my desk wearing my old middle school cheerleading shirt and listening to K-Ci & Jojo, I feel like I’ve been transported to a time that has since become a series of distant memories. Maybe there’s a reason I’ve let these memories gather so much dust; any time someone mentions sixth through eighth grade, I dismiss them with a quick “Those were the worst years of my life,” and then move on to the next topic. And yet, there are certain aspects of those three years that give me that warm fuzzy feeling. Ask me about my favorite Halloween nights and you will learn that two of them took place when I was a tween (which wasn’t what we called ourselves back in the day, but I digress). Play I’d Do Anything by Simple Plan for me and I will go on and on about the concert I almost attended just to hear that song live, then tell you about the boy that sixth-grade-Val used to associate the song with. Mention the band Something Corporate to me, and I’ll tell you all about the friend who overheard me proclaiming my love for Andrew McMahon in eighth grade and then gave me his copy of Leaving through the Window. The point is, as horrible as I made those years out to be, I still have been able to look back on a lot of it with a smile. When someone brings up an interest or hobby I had when I was younger, even if it’s something I have since grown out of, I’m reminded mostly of the good feelings those elements gave me. 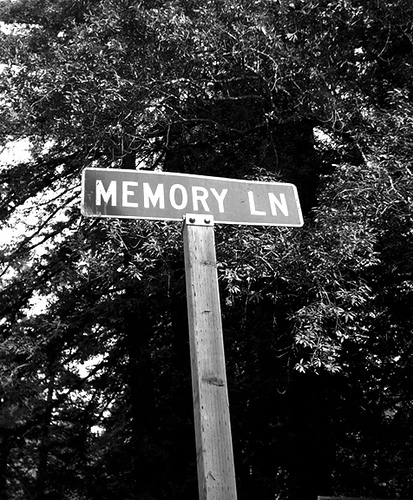 Even when something led to a not-so-fond memory, the nostalgia itself can be just enough. It all reminds me of something my Advertising professor told us last spring: we tend to react well to the things that remind us of our past. It’s the very reason why my old mentor brought us Gushers and gummy worms as snacks during my freshman year of college, and the same reason why twenty-something-year-old girls still occasionally listen to the Spice Girls. Regardless of what was going on in our lives ten or fifteen years ago, we generally conclude that it was a much simpler time than the one we are currently in. Therefore, everything looks better in black and white (and sometimes sepia) because those colors give everything a vintage feel. We like to romanticize the past, even if it had its darker moments. — Tweet this! However, sometimes I don’t think we cherish the present enough. Regardless of how artistic a black-and-white photograph may look, just think of the beautiful splash of colors in any given “present” picture, and remember that while nostalgia is great, too much focus on the past will leave you stuck there. The Friday Five: Best Friend Edition! Val your amazing. This is so true, I was just thinking about the old times last night. I missed it so much. But you are so right by saying thining too much about the past will leave you stuck there. I love you. I admire your writing a lot and love how introspective your posts are. I definitely regard high school and middle school as pretty bad years but at the same time, there are aspects of them I miss. The simplicity of those years make me nostalgic, even if at the time that very simplicity was what was driving me crazy about life. Thank you so much… I really appreciate that 🙂 I completely agree with you. There is a lot of good and bad that comes with the simplicity of our youth!